A huge welcome back to all of our Mustang Families! We hope you and your child(ren) are looking forward to the 2017-2018 school year! 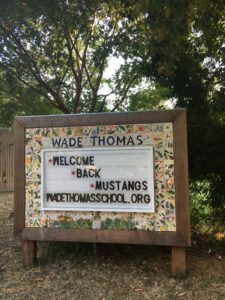 Wondering what the Wade Thomas Parents Association is up to? Take a moment to check out this message from our new WTPA Presidents. You’ll find information on this year’s leadership team, volunteer opportunities, fundraising, and upcoming events. We know the transition back to school can bring up questions and the WTPA is here to help smooth the way! Please don’t hesitate to contact us. Let us know how we can help! Please also reference our FAQs for new families.